Set in the heart of Banff National Park, a UNESCO World Heritage Site, Fairmont’s Banff Springs Resort and Spa has lured royals and celebs since its opening in 1888 – well before Kate and Wills crossed the Canadian border. Given the area’s stunning natural aesthetics and the grandeur of this iconic Canadian resort, it’s easy to see how this property singlehandedly kicked off tourism in the famed Canadian Rockies. Today Fairmont’s Banff Springs continues to woo alpine and luxury enthusiasts alike, all in search of that decadent adventure in an otherworldly setting. Slip in to one of Banff Springs’ 768 well-appointed rooms in the Scottish baronial-style castle property; no two rooms or views are alike. Each room offers cozy yet classic accommodations with sweeping Alberta mountain views. If you’re looking to tip your holiday hat to the past, go for a Signature Room in the main building of the castle, reminiscent of that elegant era of travel. Expect crown molding, ornamental fireplaces, grand chandeliers, and a sophisticated ambiance. A big part of Banff’s allure is its signature springs. 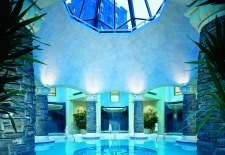 Fairmont Banff Springs Willow Stream Spa boasts a European Mineral pool, the only one of its kind in the area. It’s an homage to the two Canadian railroad workers who discovered Banff and the town’s natural hot springs more than a century ago. Allow the pulsating waterfalls in the spa to relieve strained muscles while the mineral pool in the heart of the spa rejuvenates body, mind, and spirit. Soak in this oasis while you overlook sweeping views of ancient glaciers, endless ranges, emerald waters, and a cobalt blue sky. Be sure to acclimate with Willow Stream’s signature High Altitude massage ($275). The specialty blended oils coupled with a massage and bath address the rapid breathing, headaches, and muscle fatigue associated with a change in altitude. The signature Rockies Rehydration treatment ($185) addresses the dry skin often associated with alpine activity. Healing begins with a dry brush exfoliation, followed by an aloe and algae combination soaked into the skin through a deep massage. Prepare to drift far, far away once wrapped in a blanket. Everyone’s an Original Summer Spectacular: Book by July 20 to receive your third night free, plus 1,000 frequent flyer miles on Aeroplan, Asia Miles, Etihad Guest, Miles & More, or United Airlines Mileage Plus; rates from about $313/night, valid for travel through September 30. Golf for Free: If hitting a few links is how you release urban kinks, book this Golf for Free package, which nets you a free round of golf on Banff Springs’ 27-hole course for every night’s accommodation; rates from about $472/night, travel through the end of golf season (typically in October). To book, visit www.fairmont.com/banffsprings, or call (800) 257-7544. See our Banff Travel Guide for more trip-planning information, then use our Travel Search price comparison tool to find the lowest rates on flights, hotels, packages, and more travel deals.